Hardman Signs has offered top-quality Austin sign services since our doors first opened in 1987, and we're the company to call with all of your signage requirements. We employ some of the most talented and experienced personnel in the area, with on-staff designers, project managers, site analysts, engineers/manufacturers and installation/maintenance/repair experts. Our complete roster of Austin signage services makes us the best-equipped company to call for all of your signage needs - read on to learn more about our professional sign services. Sign Design: Sign design is easy when you work with the experts at Hardman Signs. Sign Fabrication: Need assistance with sign fabrication? Give us a call. Interior Signs: Our Austin sign services keep the businesses and buildings of the Southwest navigable. Outdoor Signs: Looking for outdoor signs? Contact us for Austin signage services. Sign Repair & Maintenance: Our professional sign services don't stop with design and installation - we also offer repair and maintenance. 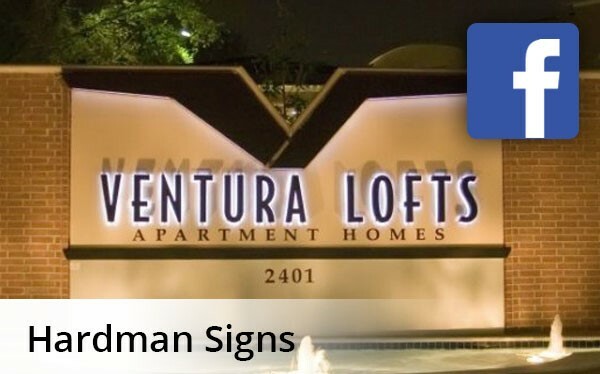 Hardman Signs provides the Austin sign services that our city's businesspeople need. To learn more about us, fill out our FREE, no-obligation quote form or call today.